Do you own a small business and are looking for a facility that can help in creating professional looking invoices? In this case it’s high time that you should explore the online platform. The online medium will surely help to create an invoice in an unparalleled manner. The end result would be that your small business will be perceived as a professional entity by the clients. Why there is a need for professional invoice creation facility? An invoice creator facility is a must if you want to give a professional appeal to your business. You can create customized templates, company logo and signature with the help of professional invoice maker tool. Thus, sending top-notch invoices will become a hassle free process. Your clients will really appreciate your decision of sending unbeatable invoices. An invoice tool will not only help you to create invoices but you can also manage various other things like purchase orders, delivery notes, estimates etc. It’s like a wonderful aid for small business and the operations would be carried on in a smooth manner. 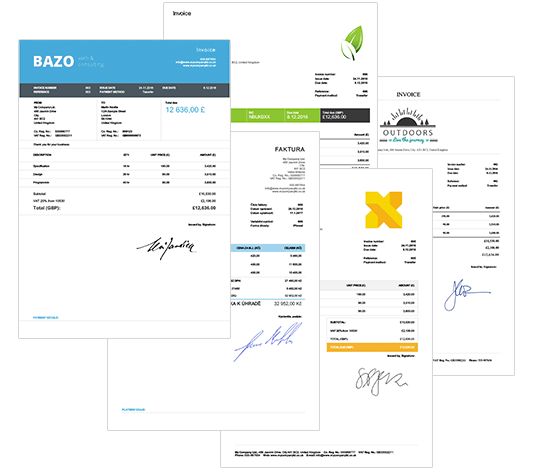 With the help of invoice maker you can easily track the business receipts as well as expenses. You just need to take the images of receipts and side by side you can attach them with the respective expenses. This process will help in easy classification and you will instantly come to know that whether business is making profits or losses. In order to get a quick glance of business performance you can view the charts and reports. The invoice creation facility comes with an option to add pay button. Thus, you can add a pay button while creating online invoices and it will help in faster recovery of money from the clients. You can add options like payment through credit card, debit card, PayPal etc. Professional invoice creation facility will help you to manage your team in a better manner. You can add different users and give them the access to create and manage invoices. Suppose if you want that you and your accountant should access the invoice creation option then in this case you can easily collaborate with your accountant. He or she will have access to the invoice records on a real time basis. This kind of facility will help in avoiding duplication of efforts and ultimately time would be saved to a great extent. Why small business owners love the option of invoice creator? Small business owners find it very difficult to hire a specialist source for creating and managing invoices. Thus, for them the invoice creator facility is like a blessing. If you are a small business owner then you will surely understand this fact. Such a facility will help you to generate recurring invoices in an automatic manner. You will also come to know that whether your client has viewed the invoice or not. You can even send payment reminders to the clients. An important thing to note is that invoice creator supports multiple languages and currencies. So, you can set the preferences accordingly. You can also apply discounts on invoices and there is a feature that will help you to preview the invoices before sending. Invoice creator will also help in automatic tax calculations. There is no doubt about the fact that professional invoices will prove to be a game changer for your small business. You will be able to handle different aspects in an unprecedented manner and a lot of efforts as well as time would be saved in the process. Online invoice creation facility is simply excellent and can be accessed from any remote location. So, instead of following the traditional methods of creating invoice, try something completely innovative. You will find the invoice creator facility easy to integrate, extremely supportive and user friendly.